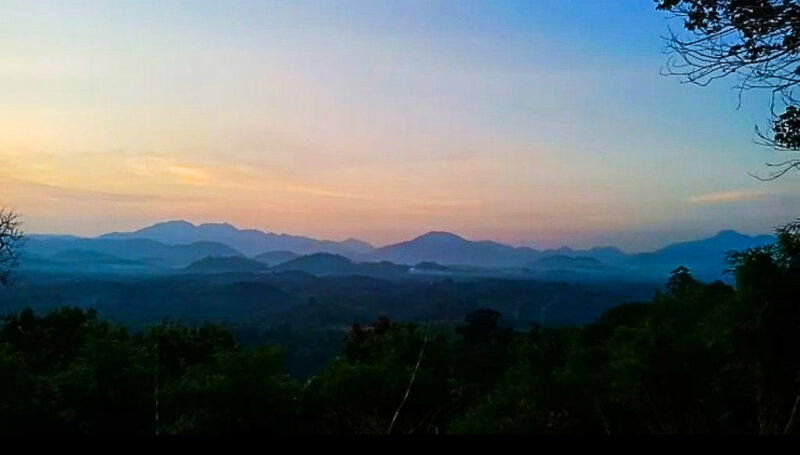 Explore the backroads of Borneo and beyond, and get off the beaten path with Kalimantan/Borneo’s only Woman-Owned Tour Company! 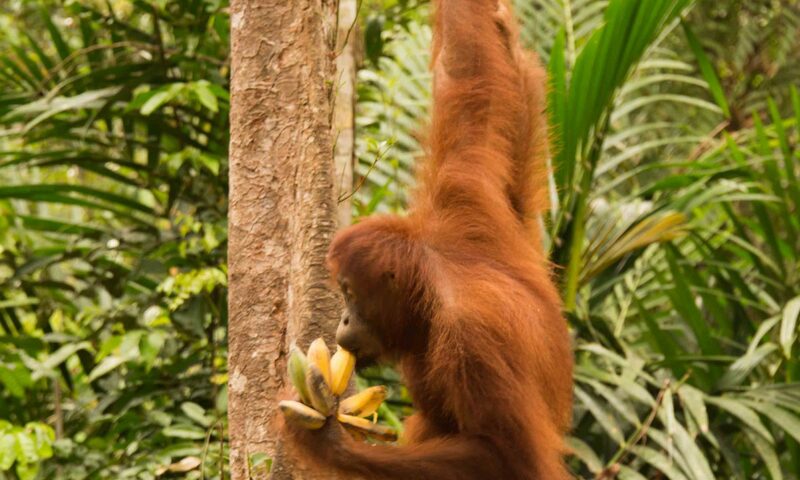 Tanjung Puting National Park and a klotok boat tour to see the orangutans is usually the highlight of most visitor’s trip to Kalimantan (Borneo)—but there is even more to Kumai and Pangkalan Bun, Kalimantan, Borneo! 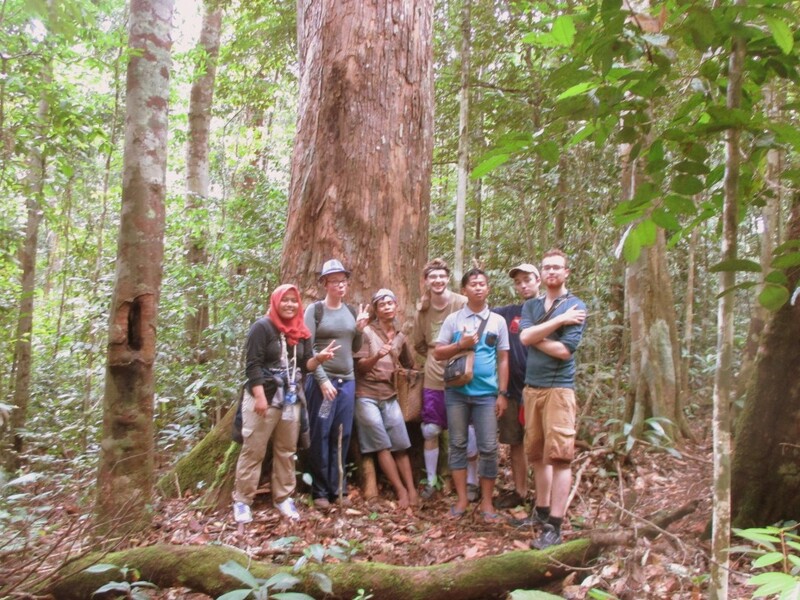 Stay a little longer, take another Tanjung Puting eco tour, visit a traditional Dayak village, get to know the local culture, enjoy the hospitality of a village homestay, take a cooking class, trek to a waterfall and camp in the jungle, explore the turtle sanctuary, and savor unspoiled, pristine beaches. 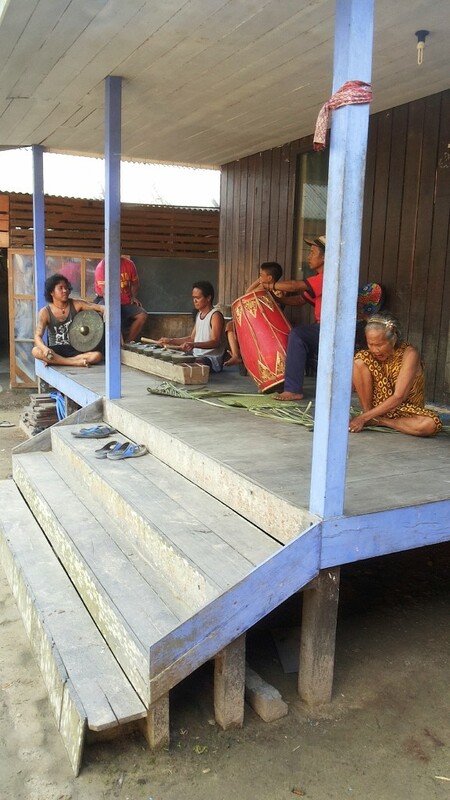 Kumai is home to several ethnic groups, Malay, Dayak, and Madurese (originally from East Java), and it is a fascinating place to visit, with lots of cultural diversity. 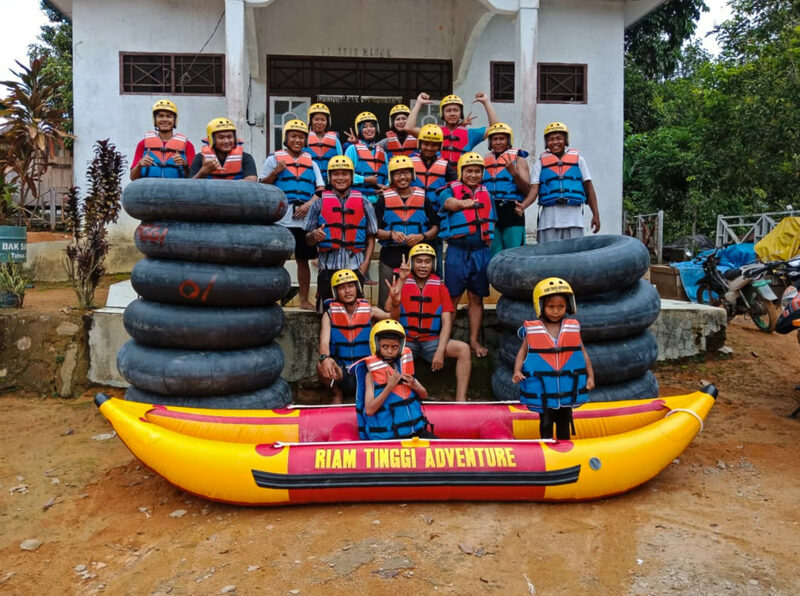 I am happy to arrange other activities and local tours for you, in addition to a Tanjung Puting orangutan tour and Tanjung Puting National Park wildlife viewing. Please let me know your dates and what you are interested in, and we can take it from there! We just added several new cross Borneo adventure and wildlife tours—come explore east, west, and central Kalimantan! We just added a new trip, snorkeling and beach trekking on Gili Labak, a serene little island off the coast of East Java, near Madura Island. Enjoy meals at local restaurants and local homestays, accompanied by a local guide. We will pick you up at Surabaya airport, so this trip is a perfect add-on before or after your Kalimantan (Borneo) travels! We will pick you up at your hotel at 11.00, then travel by private car to a traditional Dayak longhouse. We will continue to Istana Kuning, the former sultan’s home, in Pangkalan Bun at 12.00. It is nicknamed the Yellow Palace, as it used to be swathed in yellow fabric, which represents the royal family. It has been reconstructed of ironwood (Eusideroxylon zwageri) or ulin, which is known for its strength and durability, and is used to build bridges, foundations, and piers, and for flooring. It has been known to resist rotting for up to a century. Ironwood is very slow growing; trees 25-30 years old may only be 10 centimeter (four inches). We will enjoy lunch at local restaurant with vegetarian and regular options. 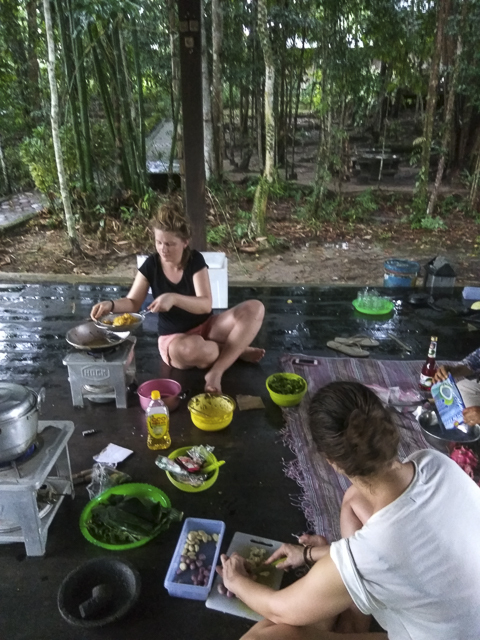 After lunch we will cruise up the Arut Selatan River via a gethek (small klotok ) to see the Malay peoples doing traditional activities, and stop at Rainbow Village. We will return to your hotel, and finish the tour at 15.30. We will pick you up at your hotel, airport, or klotok boat at 07.00 and travel by private car to Lamandau City. 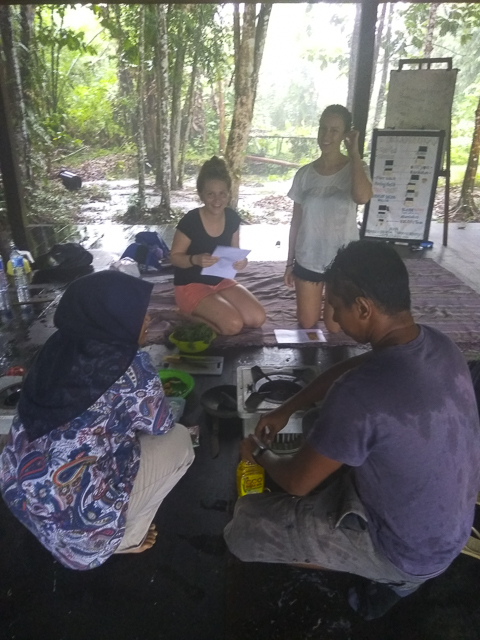 We will stop to obtain the required police permit, and take lunch at a local restaurant (warung), which offers vegetarian and regular menu. 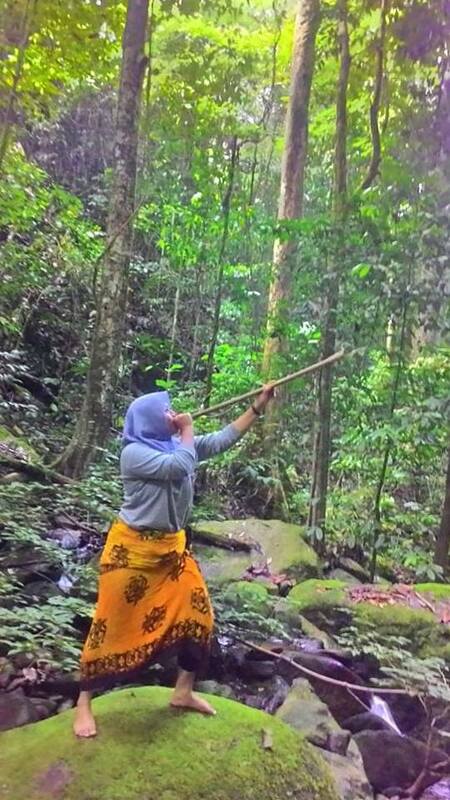 It takes approximately 4-5 hours to travel to the Dayak village of Riam Tinggi village. We will stop at the lodge to rest, then walk around the village. After dinner, the Dayak leader will start a ceremony, which includes the traditional Dayak dance, the begondang. After the evening ceremony, we will return to the lodge to sleep (L, D). After breakfast the porters and team will prepare for the jungle trek. We will start at 08.00, and walk about eight hours through the jungle. We will take lunch at our first stop, then continue to our second stop at a small river. We will stay at a small cottage with a tent next to the river. We will have dinner and sleep there overnight (B, L, D). 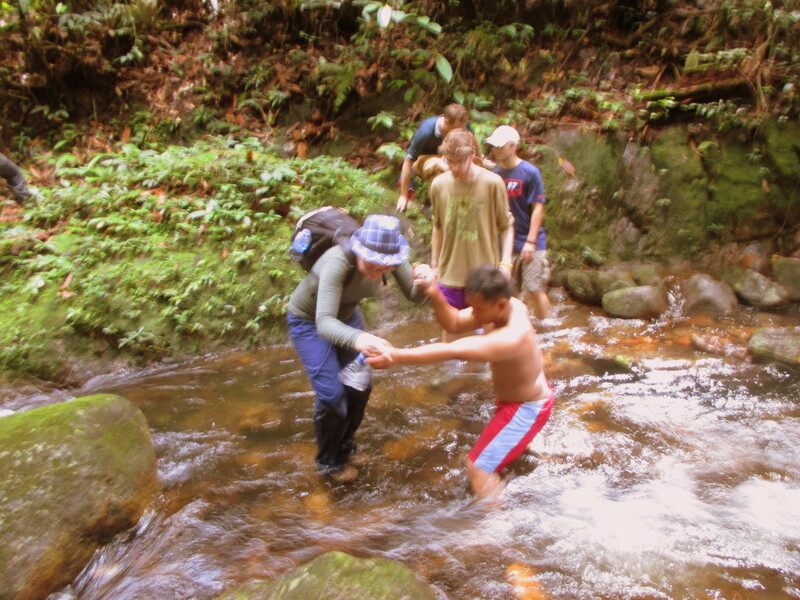 After breakfast, we will walk from our camp back to the village for another activity, such as rafting and tubing. 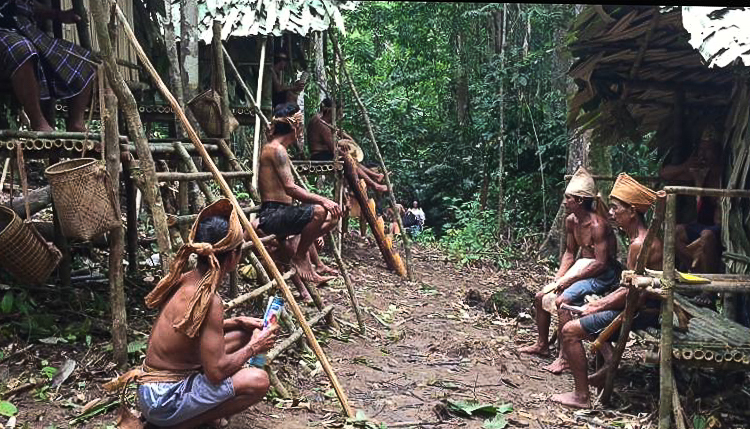 After the activities, we will return to the village for lunch, then drive to your next destination or hotel. The tour will finish around 18:00 or later (L). We will meet in Pangkalan Bun, and drive to the Dayak village of Kundangan (about five hours away, in the district of Delang). 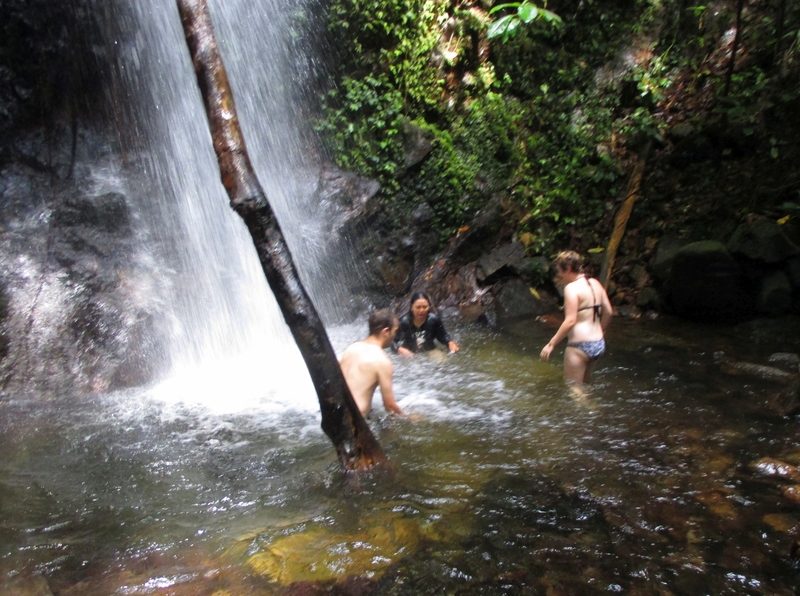 Here you can still experience original, Dayak culture and the tranquility of the jungle. 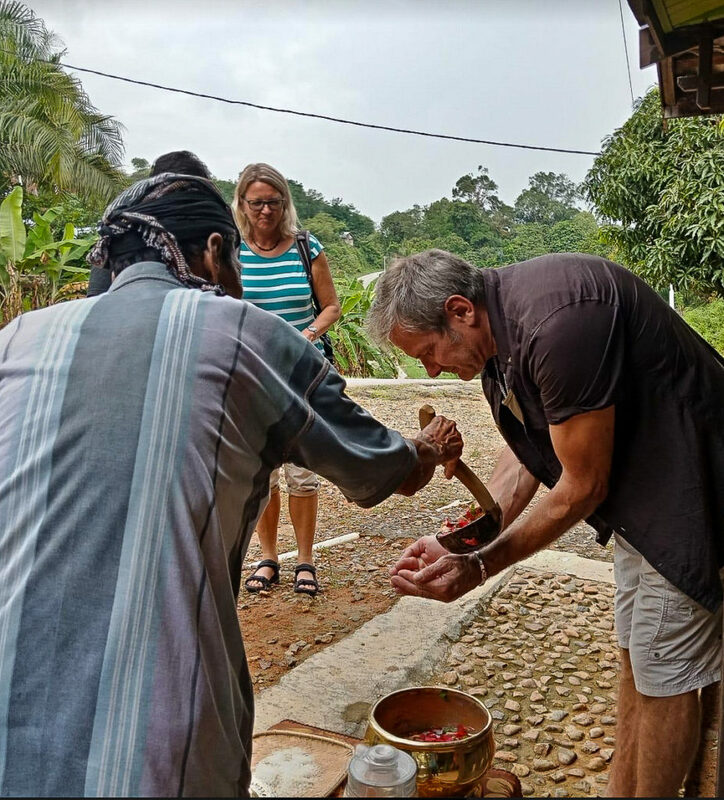 During this three day/two night trip, we will be greeted with a welcome ceremony with traditional dance (begondang) and traditional drink (tuak), meet local villagers, visit Dayak homes, and learn how to weave mats from grass. 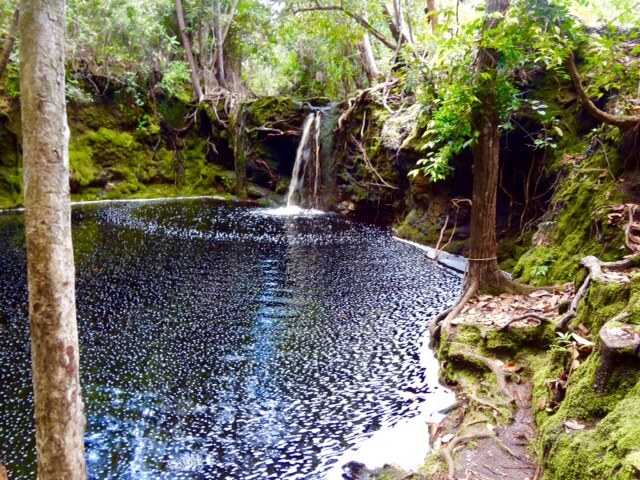 We will trek about three hours to a beautiful waterfall, where we will set-up camp. 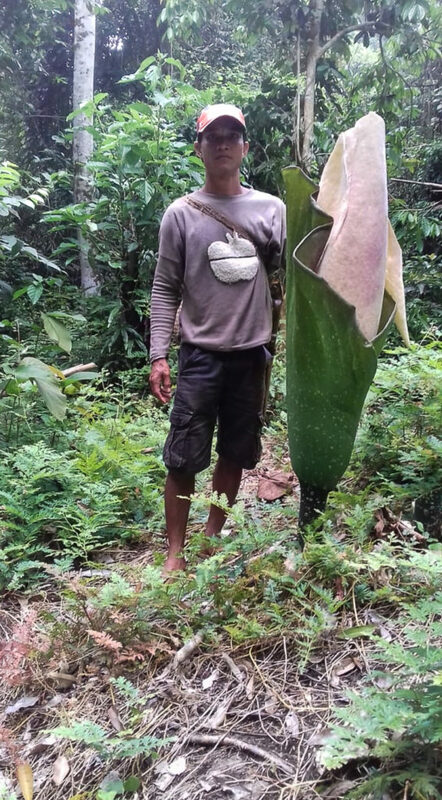 Dayak locals will help us with our gear, show us how to survive in the jungle, and how to trap wild boar and hunt with the blow pipe gun, teach us about the local plants and animals, and help us camp. 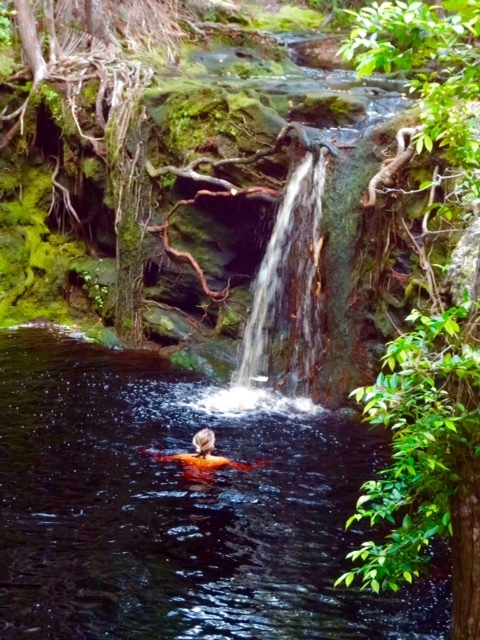 We will swim in the waterfall, and enjoy the serenity of the jungle and river landscape. 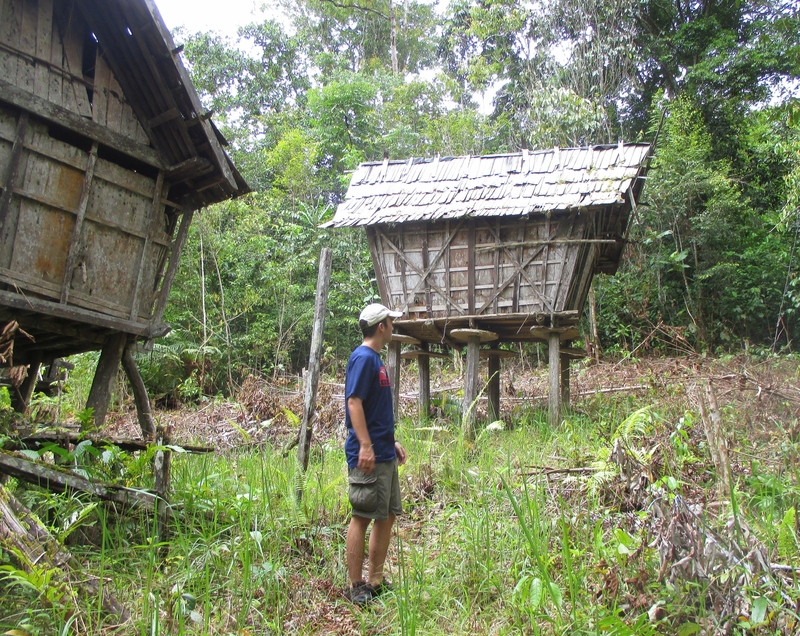 We will spend one night in the Dayak longhouse and one night camping in the jungle in a tent. 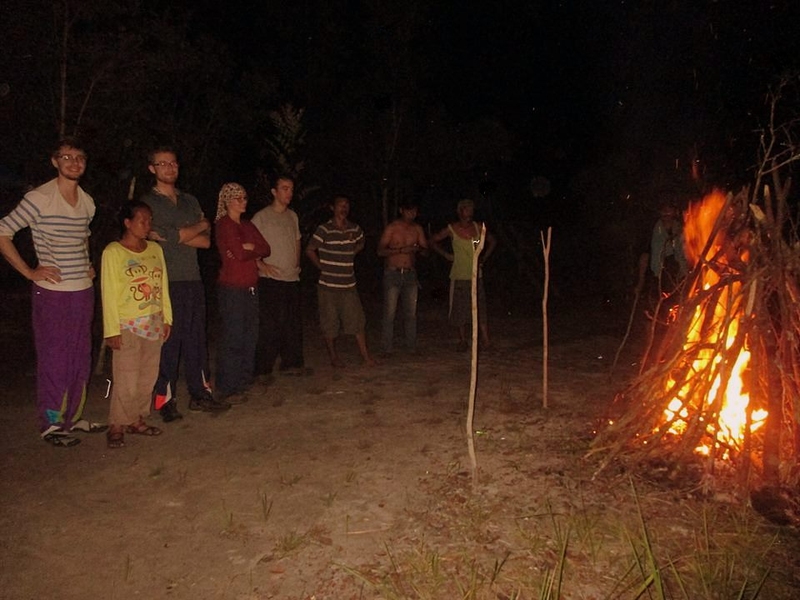 Overnight under the Stars and Learn How to Survive in the Jungle (near the Dayak Village of Kundangan, Kalimantan, Borneo, Indonesia). Siti is on the far left. 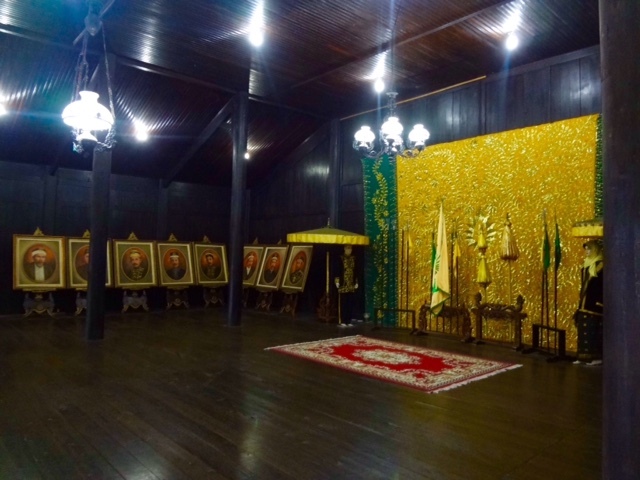 This day trip begins at Istana Kuning, the former sultan’s home, in Pangkalan Bun; the tour is usually given by one of the sultan’s descendants (5000 IDR/$0.45 USD motorbike parking and 50,000 IDR/$4.45 USD tip to the caretaker). It is nicknamed the Yellow Palace, as it used to be swathed in yellow fabric, which represents the royal family. It has been reconstructed of ironwood (Eusideroxylon zwageri) or ulin, which is known for its strength and durability, and is used to build bridges, foundations, and piers, and for flooring. It has been known to resist rotting for up to a century. Ironwood is very slow growing; trees 25-30 years old may only be 10 centimeter (four inches). 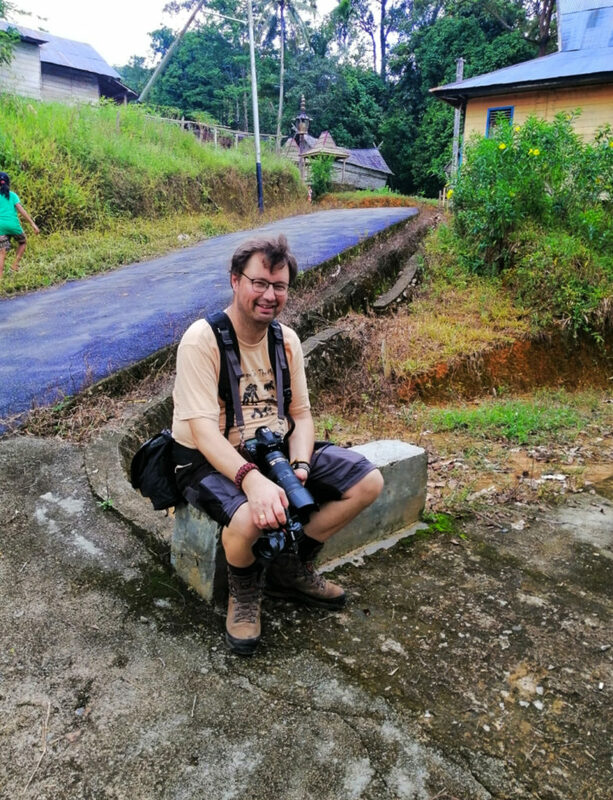 After Istana Kuning, we will visit a local Dayak community along the Sungai Arut River via small klotok boat; the Dayak are a local tribal group indigenous to Borneo. 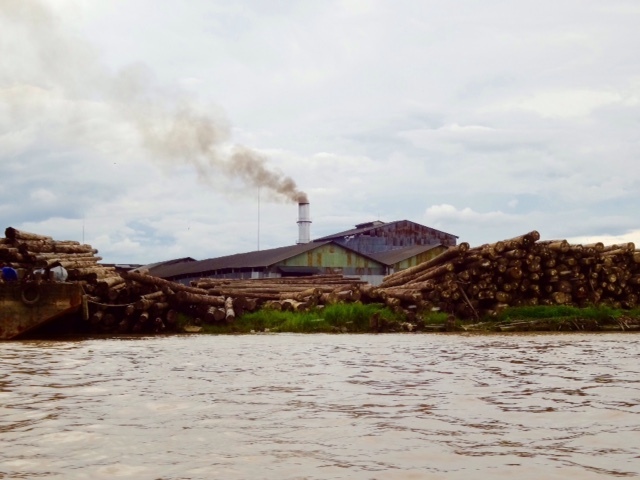 We will continue to one of Indonesia’s largest logging companies, Korindo, which employs over one thousand people, and which has been cited by Greenpeace in the past in other parts of Indonesia. We will witness the environmental challenges facing the Kalimantan ecosystem and Tanjung Puting, a mega biodiversity hotspot and the logging interests. 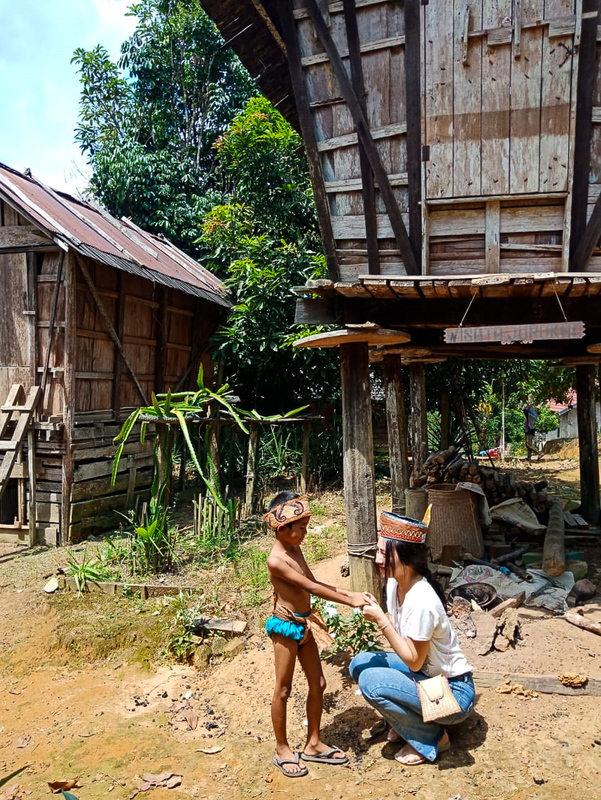 On the return trip to Kumai, we visit a traditional Dayak longhouse in Pasir Panjang, a modern Dayak village, which is the home of Orangutan Foundation International Orangutan Care Center Orangutan Foundation International quarantine area and training forest. 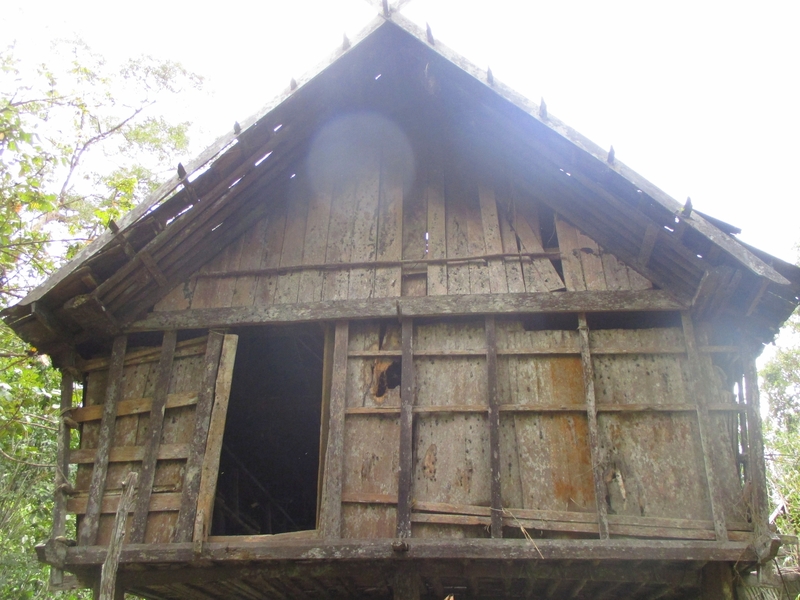 The Dayak traditionally lived in longhouses called umaq daru, with a whole extended family or a clan living collectively in one longhouse. 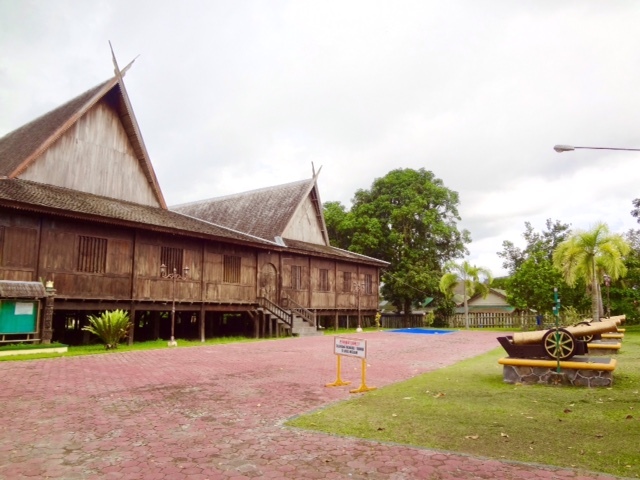 Today most longhouses have been converted to meeting halls and performance spaces for traditional music and dance performances. 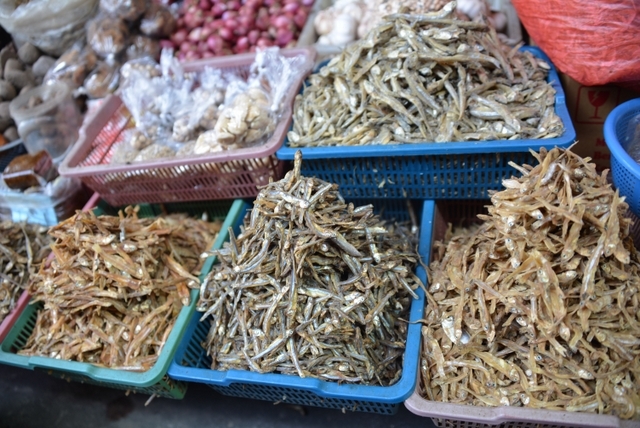 We will conclude with an optional tour of the Kumai fish market. 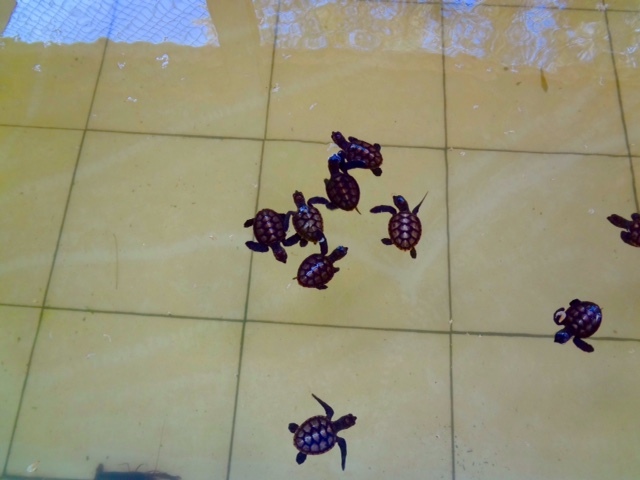 This day trip takes you to Tanjung Keluang, a small conservation project ran by the Indonesian Nature Conservancy Agency (local name, BKSDA), where green turtles (Chelonia mydas) and hawksbill turtles (Eretmochelys imbricata) are protected and released. You also can name and release your own baby turtle, but fees apply. 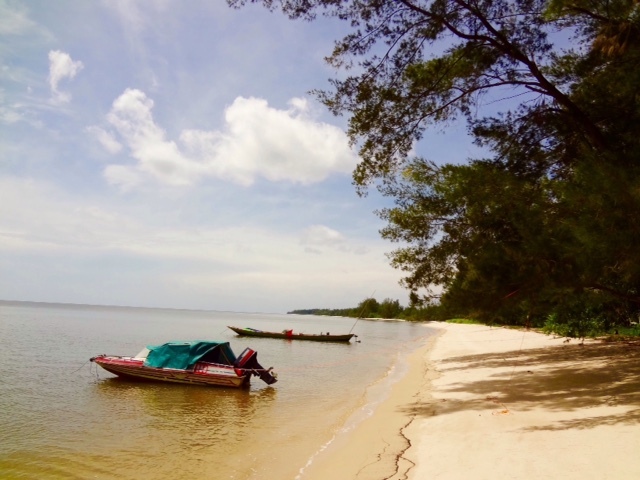 We can travel by car or motorbike to Kubu Beach, then by klotok or speedboat to Tanjung Keluang. Tortoises, terrapins, and turtles (from the order Chelonia) are threatened due to excessive egg collection, beach development, fishing, and pollution. The endangered green sea turtle (Chelonia mydas), also known as a green turtle, black sea turtle, or Pacific green turtle, is not actually green on the exterior; the green is the color of the turtle fat. Female green sea turtles come ashore between June and October to lay their eggs on Tanjung Puting National Parks western beaches. They use the temperature of the sand to determine the tideline, and then bury their eggs above the tideline. Painted terrapins and river terrapins (also known as tuntung) are fresh water tortoises. They have relatively shorter lives compared to green sea turtles, less than 25 years. 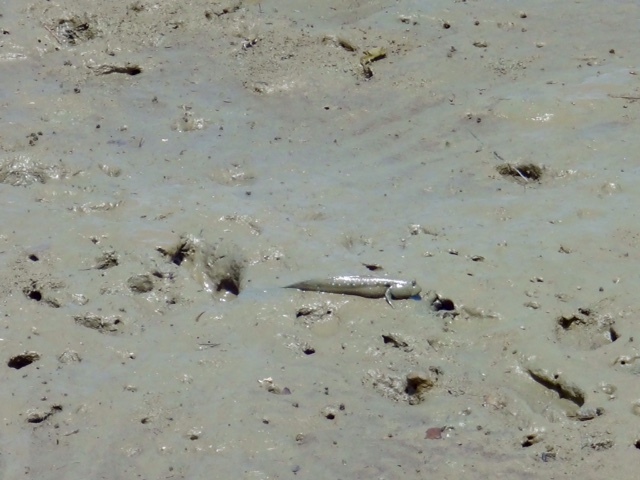 They feed on riverside vegetation, particularly mangrove fruit as well as shellfish and prawns. They nest in sandy river banks, or on ocean beaches, and their eggs are considered a delicacy (1). Venture far off the beaten track to Karaya Beach, where you will enjoy a full day of beach and local community activities. The remote village at Karaya Beach is located about two hours from Kumai by car, but seems like a world away. 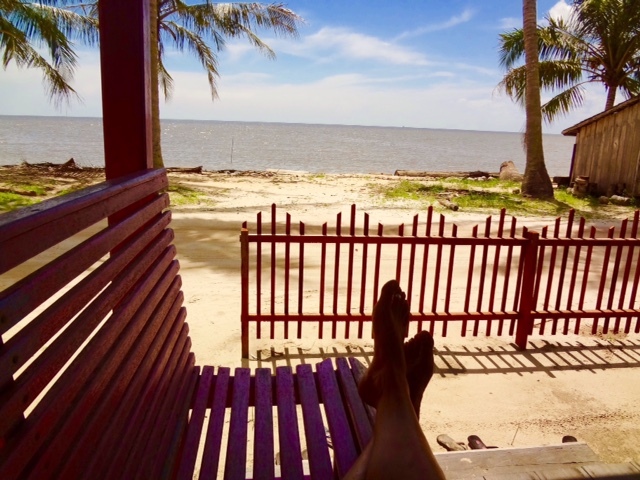 This idyllic village has not been discovered by mass tourism and is still a very local beach. You will have the opportunity to see the sungai umbang (mudskipper or walking fishes), and swim at the Pati Mambang Waterfall. 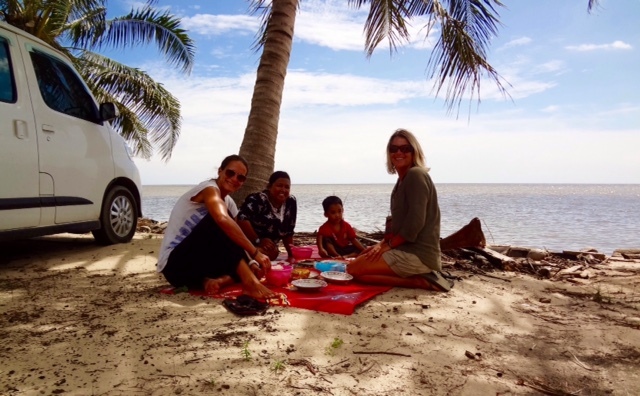 A delicious lunch will be served on the beach, prepared by Ninik Usuk (ninik means grandmother in the Malay language), a local woman from Karaya village. Spend the rest of the day chilling out at the beach, go to Teluk Bogam beach for sunset, then return to Kumai for the evening. 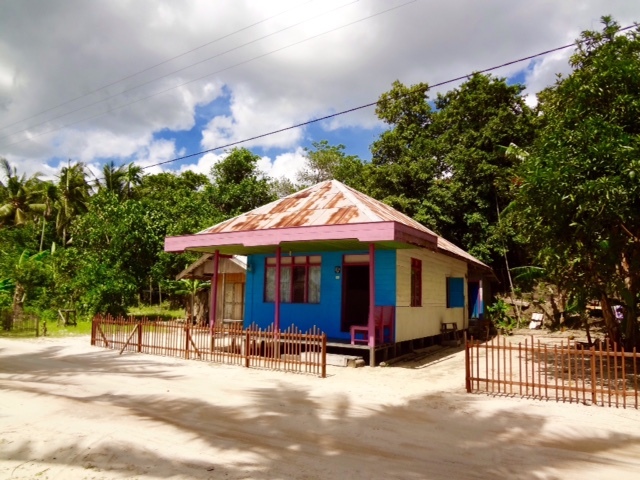 Optional overnight homestay with Ninik Usuk. Note this is a simple, but very clean and comfortable room, with Asian-style toilet. We can arrange transport to and from Ninik Usuk’s home. During this trip, we will visit a palm oil plantation in the outskirts of Kumai. 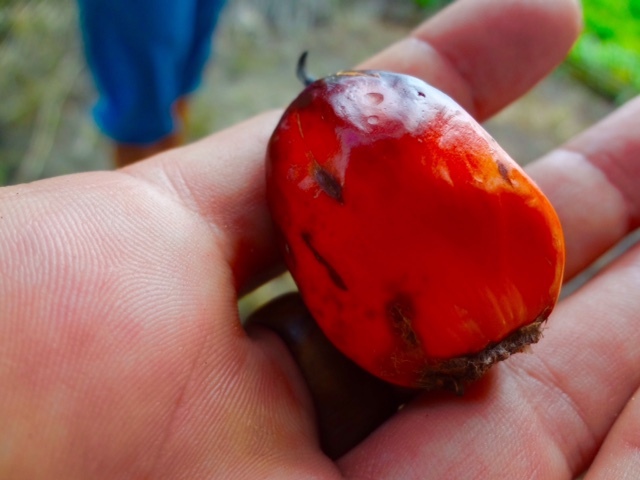 Locals will explain the process of planting and harvesting, and you will have the chance to visit and talk with the villagers, and learn more about the realities of palm oil production. Indonesia is being deforested faster than any other country in the world, and it is because of palm oil. The diversity of rainforest flora is a result of the complex relationship between tall trees, smaller trees, and other plants growing together within one environment. When primary forest is burned to open it for agriculture, it destroys this complex ecosystem. 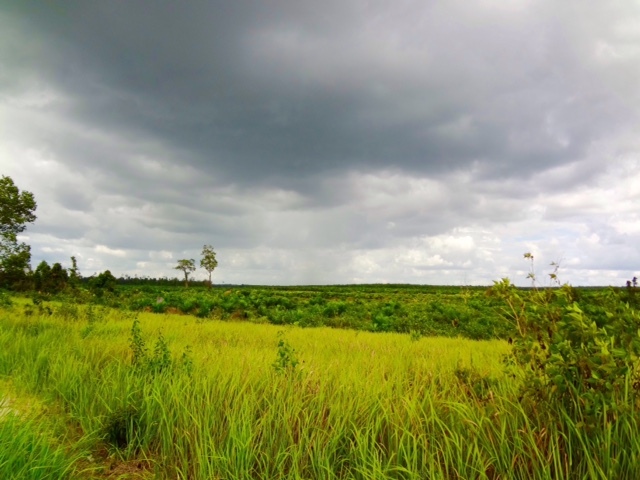 The peat swamp and fresh water swamp forests in Tanjung Puting were once common along the south coast of Borneo from Banjarmasin in the east to the Kapuas River near Pontianak in the west. 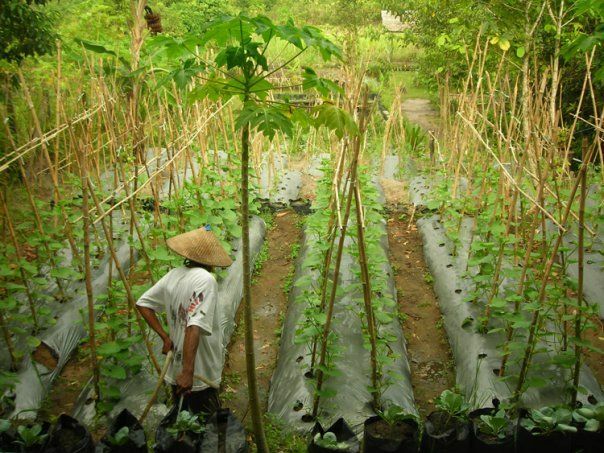 Much of the Kalimantan swamps have been converted to agricultural cultivation such as rice fields and to palm oil plantations. Huge areas of Indonesia are burned each year for palm oil plantations, drastically increasing the release of carbon dioxide. 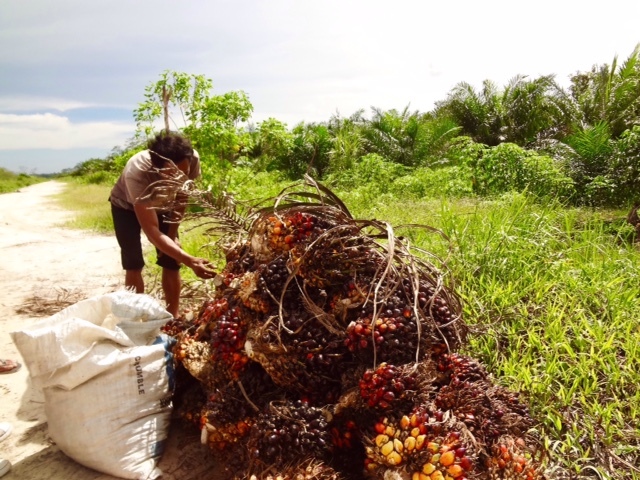 For more information about the impact of palm oil production, please see this article. 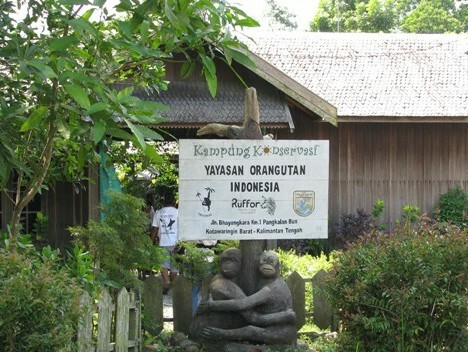 Run by Yayorin (Yayasan Orangutan Indonesia), a grass roots conservation NGO working to preserve Kalimantan’s forests and orangutans. You will have the opportunity to chat with some of the workers, who have a lot to share about their daily working routine. 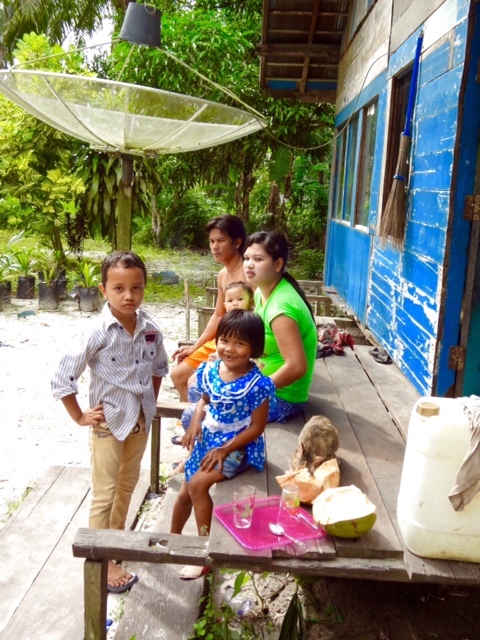 Yayorin works with local communities to promote sustainable alternatives to palm oil—a very tough job. 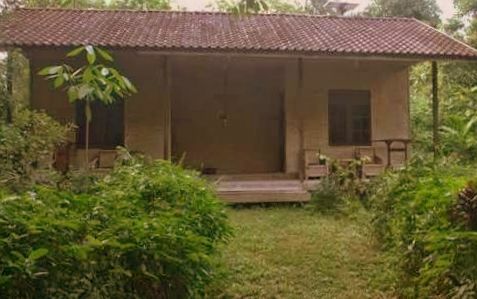 Yayorin also hosts a wonderful ecolodge, a unique woodland setting with a working fish pond and charming cottages. See the Local Lodging section for more information on lodging. 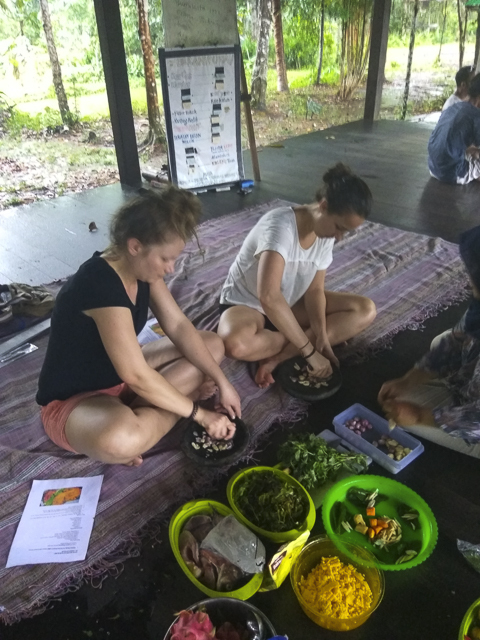 Come explore the vibrant local market, where we will buy the freshest ingredients, then return to a local home or restaurant for a cooking lesson, and prepare some delicious, traditional Malay and Dayak dishes. Indonesian food reflects its rich and long history. Indonesian cuisine—and Indonesian street food—is truly born from the spice routes and a culture of international trade. 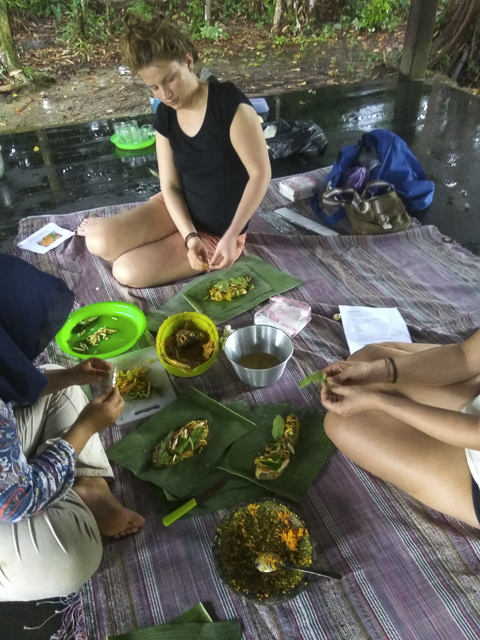 Chinese, Portuguese, and Dutch colonists and traders influenced the ingredients of Indonesian cuisine, which include chilis, cloves, coconut, coriander, cumin, curry, galangal, garlic, ginger, lemongrass, limes, nutmeg, palm sugar, shallots, soy sauce, tamarind, and turmeric. As early as 500 BCE, Indonesians sailed to southern China, where they exchanged spices, camphor, and bird feathers for bronze artifacts such as kettle drums and axes. Chinese-Indonesian trade picked up during the Srivijaya era around the tenth century and increased in the Majapahit era during the fifteenth century. Chinese immigrants began to settle in Indonesia, bringing their culture and cuisine. We will learn to prepare common dishes, which may include bakso (meatball soup), gado gado, mie goreng, mie rebus, nasi goreng, pisang goreng, saté (or satay), perkedel, telur balado, telur balado, and tempe penjet. And we will, of course, get to enjoy a delicious meal! 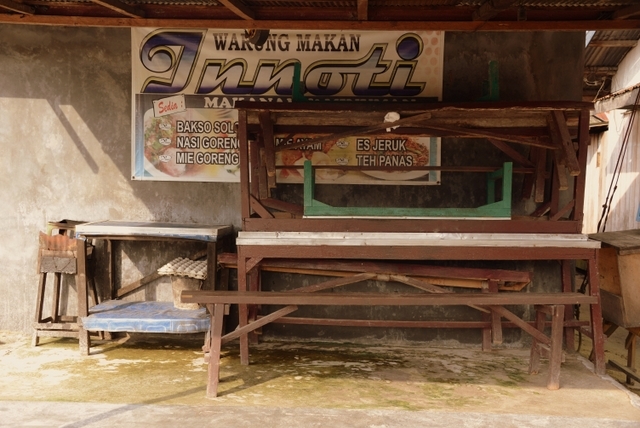 No matter how small the Indonesian town, there seems to a warung (food stall or streetside restaurant) or kaki lima (mobile vendor with pushcart; kaki lima means five legs, three for the cart and two for the legs of the vendor). If you do not see a warung, head for the market (pasar). Let us help you explore the world of Indonesian street food! 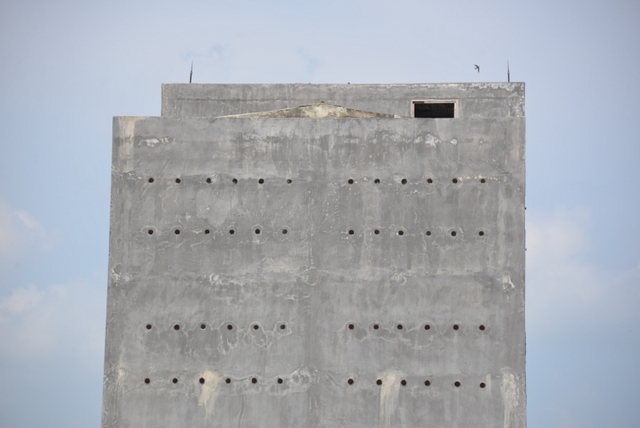 Another major Kumai industry are swallow nests. The saliva used in the construction of the nests is used for cosmetics, medicine, and food, primarily in China, Hong Kong, and Taiwan. Nests yield $5,000-10,000,000 USD per kilo (a little over two pounds), so it is big business for nest farm owners. I also volunteer at one of the Kumai schools. We can visit the classrooms, and if you have some extra time, we would love to have you volunteer! I look forward to seeing you in Kalimantan!